Photos confirm identity of 13 Copts kidnapped on Jan. 3 and seven others. ISTANBUL, Turkey (Morning Star News) – Contrary to published reports, 13 Egyptian Christians kidnapped in Libya by Islamic terrorists have not been freed, relatives said. A Libyan group affiliated with the Islamic State of Iraq and Syria (ISIS) claimed responsibility for the Jan. 3 kidnapping of the 13 Copts from a housing complex in Sirte, Libya, as well as the abduction of seven others. The group, which calls itself the Islamic State of Tripoli, posted photos of the 20 Christians on a jihadi website, and the families of the kidnapping victims have identified all of the men. “All we can do is just continue praying for their safe return,” said Nassem Ghaly Kamel, a relative of several of the kidnapped Copts. The photographs were posted on “The International Jihad Network,” a website used by ISIS and its allies to promote its ideology. The Islamic State of Tripoli claimed it had seized 21 people, though photographs of only 20 Christians appear on the site; it was unclear if a there was an extra kidnapping victim. 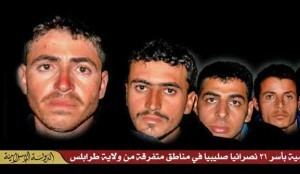 Kamel said the pictures do nothing to either encourage or discourage him that any of those abducted are still alive. Several news organizations and advocacy groups published incorrect reports based on a mistaken BBC story that confused a case of Egyptians being helped across the border into Libya with the kidnapping case. Complications arose in the border-crossing case that resulted in the disappearance of the Egyptians, and the media confusion apparently resulted from all of them being released shortly after the kidnapping of the Copts. The BBC and Agence France-Presse on Jan. 5 cited a Libyan news service, Al-Wasat, which quoted Libyan tribal leader Muftah Marzuq, head of the council of elders in Sirte, as saying the men had all been released. The BBC quoted Marzuq as saying the Christians had been temporarily detained by “people smugglers” over a financial dispute. The Christians, however, were not the same as the 13 kidnapped on Jan. 3 in Sirte. The Egyptian Ministry of Foreign Affairs on Jan. 6 issued a statement that the news service reports were untrue. While the incorrect report continued to be distributed, families of the victims verified to Morning Star News several times that no progress had been made toward the release of their family members. Identified in the jihadist website photos were Maged Soliman Shehata, Abanoub Ayad Attyia, Yousef Shoukry Younan, Hani Abd Al-Messeih Saleeb, Kerolos Boushra Fawzy, Milad Makeen Zaky, Makram Yousef Tawadrous, Samuel Astafanous Kamel, Bishoy Ashtafouns Kamel, Mina Fayez Aziz, Malak Ibrahim Taniot, Gerges Milad Taniot and Bishoy Adel. Also identified were seven men kidnapped on Dec. 30; Samuel Alahm Welson, Ezat Boushra Naseef, Louka Nagaty, Essam Badar Sameer, Malak Farag Abraam, Sameh Salah Farouk and Gaber Mouneer Adly. On Jan. 3, a group of armed men burst into the housing complex in Sirte, Libya at about 2 a.m. and abducted the 13 Christians. Initially there were conflicting reports of how the 13 were chosen. Some eyewitnesses said that the kidnappers came into the complex and asked for any Christians that were in the building to come out. In other accounts, the kidnappers went through the housing complex door-to-door, asking people’s names and identifying Christians as they went along. Hanna Aziz, who escaped the kidnapping with about 15 other Copts, said the truth lay somewhere between the two versions. The armed men went from door to door in the complex, calling for Christians by name. They also forced Muslim Egyptians living in the complex to help lure the Copts out of their rooms. Aziz escaped kidnapping simply by not opening the door when the men came to his room. Aziz said he was terrified. The kidnappers, about 15 in all, quickly gathered the Christian men and took them away to four vehicles. Some of the vehicles were “technicals” – pickup trucks with heavy machineguns mounted in the back. The next morning, the owner of the complex kicked out the rest of the Christians living in the building. The Copts were forced to hide in farms and in the hills that surround Sirte. They communicated by cell phone, trying to find a way out. Eventually a Libyan helped Aziz and 15 other Copts find a van and a driver willing to go to Egypt. Each arranged to pay US$250 for transport to the border, a fee the driver raised by US$100 per passenger halfway to Egypt, Aziz said. Aziz said economic realities forced him and others to travel to Libya for work. The choice was between grinding poverty in Egypt leading nowhere or – if Islamist militia groups could be avoided – economic prosperity in Libya. For some, despite the risks, the draw was too powerful to resist. Libya wasn’t always dangerous for the Copts, even a while after the 2011 Libyan civil war, Aziz said. On Dec. 23, a group of masked, armed men broke into the house of Dr. Magdy Sobhy Tawfiq in Sirte and shot Tawfiq and his wife Sahar Talaat Rizq. The men kidnapped the couple’s 14-year-old daughter, Katrine Magdy Sobhy, whose body was later found in the desert. She had been shot three times. The couple’s two younger girls, Carla and Carol, 10 and 9, were left behind unharmed. No money or valuables were taken from the home. Tawfiq was a doctor who had been living in Sirte since 2001. The family wanted to leave the city because of increased Islamic extremist violence and general lawlessness in the country after the ousting and killing of Muammar Gaddafi in 2011, but they were unable. Area Islamists had threatened Katrine with demands that she wear a veil. 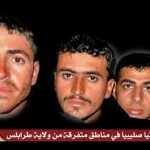 When the second group was kidnapped, many had made plans to leave Sirte on Tuesday (Jan. 13), Aziz said.